Sitting down for hours on end is hazardous to our health – whether it is in the office, at school, in the car or on the sofa. Backaches, obesity, diabetes and other conditions are the consequences of a lack of movement. It is important, therefore, to integrate dynamic sitting into our everyday lives. In a fun exhibition on the MS Wissenschaft science ship, Fraunhofer researchers are demonstrating how you can practice healthy back movements using special equipment. Many people spend a large part of their day seated: at mealtimes, driving to and from work, in meetings, working at their desks, watching TV, in movie theaters, etc. But if you do not move around enough, you increase your risk of many diseases. Sitting down for long periods causes tension and postural damage, which lead in turn to back pain – an ailment that affects many Germans. People who suffer from backache often sit stooped over, putting even greater strain on muscles – leading to a vicious circle. But cardiovascular problems, excess weight and high blood pressure are also consequences of an inactive lifestyle. The only thing that can break the vicious circle of pain and poor sitting posture is active, conscious movements while sitting and standing. To support this solution in a targeted manner, researchers at the Fraunhofer Institutes for Industrial Engineering IAO and for Silicate Research ISC have devised a personal trainer for healthy sitting and movement. Fraunhofer ISC developed the technology, while Fraunhofer IAO developed the product. A stool fitted with sensors and light-emitting diodes (LEDs) gives feedback via either a color signal or an app about whether a person is sitting ergonomically. “Through many interviews with sufferers of back pain as well as various businesses and experts, we discovered that there was a strong demand for equipment to promote people’s back health while sitting. What’s important is that you have to put a bit of time into it,” says Truong Le, scientist at Fraunhofer IAO when asked to explain the basic idea behind the LED stool. In standard mode, several pressure sensors measure the weight distribution in the seat to identify incorrect posture, such as sitting at an improper angle or sitting too long in the same position. The sensor data is evaluated and then transmitted to a PC, laptop, tablet computer or smartphone. Then the user is sent a reminder via feedback in the seat. On request, a display appears on the screen, or statistics for a certain period. A video shows that the sitting posture or the inclination of the body has been identified as problematic. If appropriate, the user will be prompted to move. With the aid of a video guide, users can carry out defined movement exercises, which the sensors also register. The pressure sensors are soft and sensitive; they can be built into a wide range of environments, such as mats, seats, steering wheels or ceilings in motor vehicles. They emit electrical pulses to control objects. To this end, they are structured like a capacitor, with an insulating film sandwiched by two electrode layers made of conductive silicone. On the MS Wissenschaft, the researchers from Fraunhofer IAO are presenting a special version of the smart stool. Users who like games can find an application in the stool that combines exercise and fun. 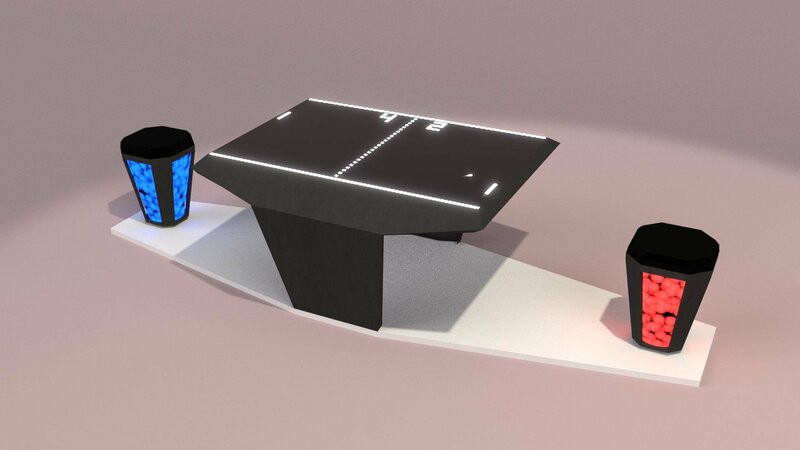 Hip movements recorded by the sensors are used to control a ping-pong game on the screen – effectively, users play by swinging their pelvis.